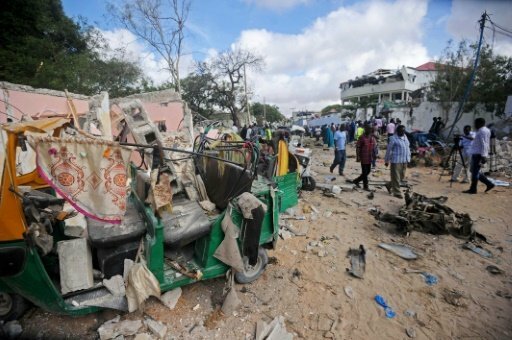 At least 10 people were killed when Shabaab Islamists drove an explosives-laden minibus into local government offices in the Somali capital Mogadishu, on Tuesday, according to the security ministry. The minibus was rammed through a security barrier outside offices in the southern district of Wadajir, injuring nine people including the district’s top government official. “More than 10 people died in the blast which was carried out by the Shabaab group and nine others are wounded,” said security ministry spokesman Ahmed Mohamud Mohamed. Most of the dead were civilians, he said. “Security guards tried to stop (the minibus) but it managed to get in and the vehicle blew up,” a local security official called Omar Adan told AFP. Another security official, Abdi Jilibey, said that more than 18 people were injured and some of the bodies were so badly burnt as to be unrecognisable. The attack was claimed by Al-Qaeda linked Shabaab militants in a statement carried by the SITE intelligence agency. On Thursday, at least 18 people were killed when six Shabaab militants launched an assault on two neighbouring restaurants in Mogadishu. The Shabaab group, which wants to impose a Taliban-style rule on Somalia, has been fighting for the last decade to overthrow successive internationally-backed governments in Mogadishu. It has also launched attacks in Kenya and Uganda, both contributors to a 22,000-strong African Union force in the country.